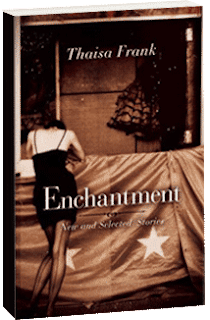 Thaisa Frank's short story collection, Enchantment, is like nothing you have ever read before. Unsettling, strange, and well, yes, enchanting, they comprise one of my favorite books of the year. She's also the author two other books of stories, two novellas, and thirty-three other stories. 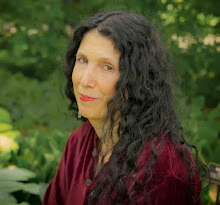 Her novels include Heidegger's Glasses, Sleeping in Velvet, and A Brief History of Camouflage, both on the bestseller list of the San Francisco Chronicle. 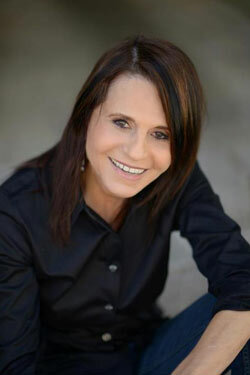 She's the recipient of two PEN awards, and the co-author of Finding Your Writers Voice: A Guide to Creative Fiction, too. I'm honored to have Thaisa here on my blog. Thank you so much, Thaisa! The stories in Enchantment are strange, weird, and well, enchanting. Where did they come from? I never know where things in my imagination come from and I can’t really will them to happen. It’s almost as though there’s a pneumatic tube of the imagination and I hang out there when other writers are occupied so I get weird and cryptic assignments: It could be a title, like The Loneliness of the Midwestern Vampire. Or the image of an enchanted man. If I play with the assignment long enough, characters appear and they make the image or title earthbound. My characters have to adhere to the laws of gravity and deal with an ordinary world. It sometimes takes a long time to find the link between the cryptic image or title and characters who are grounded in the mundane world. For example, the title story of Enchantment began when I had an image of a woman on her porch getting a UPS delivery of an enchanted man. She’d ordered him from an online site and he came with instructions to mist him twice a day. I started the story many times and couldn’t figure out how to move it forward. But when her sullen teen-aged kids appeared, I realized the heart of the story was about the woman hiding the enchanted man from her family. Not all of my stories are triggered by surreal images. I’m fascinated by people, relationships and obsessions. Enchantment has a story about a character who wants to get a piercing (I did all my research online! ), a woman who visits an old boyfriend, a cat that acts as a comforter, and two people who think they are soul mates. It also has two semi-autobiographical novellas with roots in my own life. These were hard stories to write because I had to invent and surprise myself to discover a universal element. After I finished, I felt as if I’d dived into a shipwreck and come up having lived a slightly different life. These stories start for me in the same way more surreal stories start--that is, I often find people and relationships as captivating as a title or an image. I used to be a psychotherapist and friends would say “Oh, that sounds like a wonderful profession for a writer.” But it wasn’t a good profession because most psychological theory tries to explain mystery and I was more interested in illuminating it. Whether I write about what’s apparently “real,” or something more surrealistic, I have to feel captivated and enchanted myself or I don’t feel motivated to write the story. As a kid I had a viewer that held discs so you could look inside and see three-dimensional scenes. I remember looking at Little Red Riding Hood, poised in the dark forest with her basket. I could feel the quiet of the woods and she seemed real, alive in another realm. I wanted to find a way to reach her. So when I talk about feeling enchanted, I’m talking about a feeling that started when I was very young. Of course trying to talk about where stories come from feels a little like telling a fishing story: So much happens below the surface. So much happens quickly. And so much happens beyond my control. I think most writers feel this way. The line between what’s real and what’s imagined is very blurred here, so I’m wondering, what are your particular boundaries like? This has its roots in huge and eternal questions. What’s real? What’s imagined? What’s a belief? What’s fact? The debate never seems to end. For myself--boundaries shift. When I have to cook a meal or teach or go to a party, I lunge for all the things that have nouns: Salt, sugar, paper, briefcase, earrings, lipstick, heels. Nouns and what they stand for feel solid and reassuring. I also like documentaries--the ultimate marriage between facts and images. But there’s a part of life that has a shifting, luminous edge for me. So I live between reassuring fixtures and what’s inchoate, barely intuited, hard to put into words. That may be one reason why I’m receptive to what seems “given” by the imagination. Also putting something fantastic in a story but grounding it in the ordinary world is one way to explore these blurred lines. Readers I’ve met have told me this kind of fiction encourages them to imagine as well as see dissonance and absurdity. Of course all fiction encourages readers to imagine and has blurred lines. Readers want to follow the characters home and see the difference between the stories they tell on the street and the way they live privately. My work ends up having to do this, too. One last thought about the imagination: It seems to know more than we do. When I wrote Heidegger’s Glasses I made things up about WWII in the first draft because I do research later. When I got around to research a lot of what I made up really happened. Some coincidences must have been because I knew the facts subliminally. But there were so many, it seemed as though the creative imagination has phalanges and can time travel. Other writers say it happens to them, too. You’ve written both novels and short stories, including Heidegger’s Glasses, A Brief History of Camouflage, and Sleeping in Velvet. How does writing short stories compare to writing novels? In the beginning, the process is always the same. There’s a wonderful sense of free-fall during those first triggering sentences--the first promises to myself and to the reader. But they also create scaffolding that begins to define a world and at some point I have to improvise within the limits of that world. Eventually--whether it’s a novel or a short story--I come to a dead-end and think the exciting, triggering elements have tricked me into writing something that can’t go anywhere. But if I keep staring at the page the characters tug at my sleeve and move the story forward. Here’s how novels and short stories are different for me: Scenes in short stories have a way of arranging themselves into a narrative arc without much advance plotting, but scenes in a novel have to sustain a longer momentum. At some point--maybe a third of the way through the novel--I have to figure out where it’s going. (I always feel especially stupid, as though I’ve landed on the moon without oxygen.) Once more, I’m hopelessly dependent on my characters and the way they’ll remind of their secrets and conflicting agendas. And if I listen--especially to what they’re hiding--I get clues about the larger arc. Do you prefer one to another, and if so, why? I like and find both forms frustrating and wonderful for different reasons. Short stories and flash fiction take less time and when I’m finished I can’t imagine that they could have turned out any other way. But there are so many strands in a novel it’s harder to be sure it had to turn out one way rather than another. Novels also take more time and have more dead-end moments. On the other hand, writing a short story is a little like being employed for only a few weeks and a novel is a fulltime job for at least a year. When I wake up I know what world I’m going to visit, what challenges I’m going to face. I also miss the characters when the novel is over--even imagine they’ve gone on to be in other novels. Characters in short stories seem more ephemeral. And you’ve also written a book on writing, Finding Your Writer’s Voice. What one bit of advice do you think is especially important for new writers (or seasoned ones) and why? In my own experience, morale has been my greatest resource. It determines the risks I can take and how resilient I am--both in my writing and occasional confusions in the publishing world, which happens to be going through a second Gutenberg-Bible revolution. Other writers have talked about morale, too, and I’ve seen it in my students who persist and publish. So I think it’s important to create a life that supports your originality, your courage and your voice. 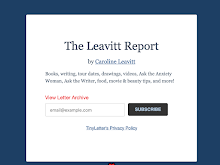 Grace Paley put it best when she said that a writer needs just two things: Low overhead and a person who believes in your work. Writing’s a little like having a store. I may not get any customers, but if I don’t show up there I have no way of finding out. I’m a sprinter, not a marathon runner, so I tend to write in long spurts and have days when not much is happening. But even during those days, I hang out with my work and try not to teach or make appointments until late afternoon. I take breaks by running and miss a great walking-city like New York where I can find a new neighborhood every few blocks. I often write late at night. What’s obsessing you and why? The novel I’ve started is obsessing me. I know just enough to realize it’s a novel but there are so many things I don’t know and want to know. I feel like a kid at a birthday party beating a steel piñata. I’m sort of glad you didn’t. But since you asked…. It’s what I look like when I read new drafts--namely like a frustrated three-year-old. I’ve crumpled up so much paper, I’m sure I’ll come back as a tree in my next life. I especially loved this wonderful expression of what can inspire the process: "But there’s a part of life that has a shifting, luminous edge for me." Thaisa is so open and eloquent about both the magic & mundane, the sublime & ridiculous that comprise a writer's experience! Thanks for this great interview, Caroline & Thaisa!